- October 31, Cvjetni Trg: dairy and egg-free muffins giveaway; premiere of the music video "My Vegan Life"
Animal Friends invites everyone to celebrate World Vegan Day, which has been honored annually around the globe since 1994. The best way to celebrate is learning about why more people go vegan every day and how veganism positively affects not only individuals, but also the whole of humanity, animals, the environment and overall sustainability. On Monday, October 31, 2016, at the intersection of Varsavska and Preradoviceva Street Animal Friends will give out delicious muffins made with exclusively plant-based ingredients, which will be arranged to spell the word "vegan". The event will start at 11 A.M. with a premiere of the music video for the song appropriately titled "My Vegan Life" by IFEEL. IFEEL makes music to speak for animals, who can't speak for themselves. In the "My Vegan Life" music video, a motley crew of characters feast and toast to the fact that their plates don't contain pieces of formerly living creatures. IFEEL explains: "Vegans for personal reasons choose not to participate in the exploitation and killing of animals, which by no means diminishes their quality of life. That's why I invited my personal friends to the video shoot, to hang out and have fun at the best vegan barbecue in Croatia. How did it go? Watch the video." The celebration of World Vegan Day started with Louise Wallis, former president of the British Vegan Society, and its primary purpose is to inform the general public about the benefits of a diet with no animal ingredients. Since more and more people are embracing veganism as a lifestyle choice and healthier eating habit, it has recently been named the fastest growing movement with an influence on human nutrition. The reason for it is the fact that people are getting more informed about the horrible practices in farming and slaughterhouses, the utter unnecessity of eating meat, eggs, and dairy, and the benefits of a plant-based diet for the environment and human health. Those informed about veganism are more likely to choose equally tasty but healthier plant-based products in stores. If you can't make it to the Animal Friends stall, you can find the vegan muffin recipe at www.prijatelj-zivotinja.hr and listen to "My Vegan Life" to get inspired to join the 30-day Veggie Challenge. Besides the popular Veggie Challenge on the website www.veganopolis.net which has been accepted by many this year, Animal Friends also offers the possibility to order the book "Mom, Dad, I'm Vegan for free through the Animal Friends Association website. 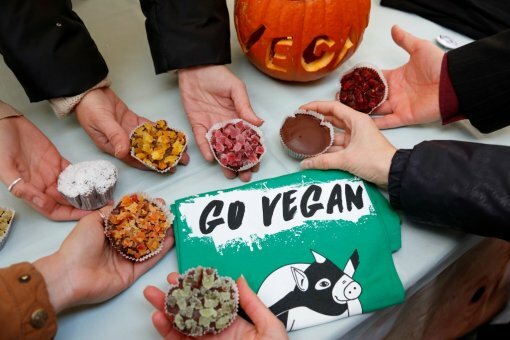 Photo gallery World Vegan Day 2016.